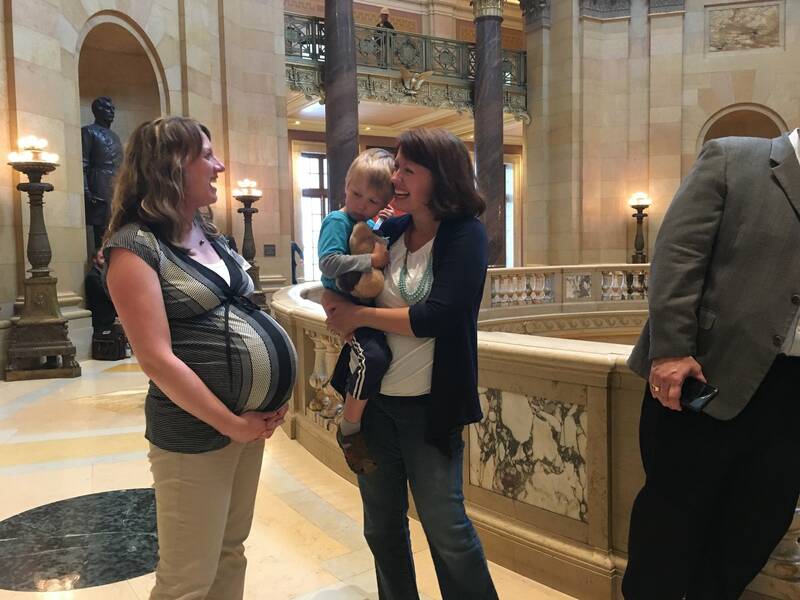 Jenna Bjork's son was born Tuesday, hours before the state employee learned the six weeks of paid sick time she was counting on should come through, despite earlier doubts. From her hospital bed Wednesday, the Department of Health epidemiologist called the paid leave news "the icing on the cake for his birthday present." "It was a huge sense of relief," said Bjork, who spent the prior week at the Capitol pleading for lawmakers to keep the state's relatively new leave policy in place. It was an unexpected twist in the midst of Gov. Mark Dayton's flurry of action on bills this week. But the benefit could provoke a court fight because some lawmakers don't think it was properly authorized. Dayton actually vetoed the bill containing the leave policy, which he had urged the Legislature to adopt. That's because the Republican-led Legislature tied it to a push for local labor standards pre-emption. They wanted to stop cities from setting their own wage and benefit requirements for private employers if they went beyond state minimums. Usually when a bill gets vetoed, everything in it goes down. There are rare exceptions, and Minnesota Management and Budget Commissioner Myron Frans said this is one of them. The vetoed legislation also included a contract ratification for state engineers, many of them employed at the Department of Transportation. The provision covering parental leave applies to all eligible employees and tracks with a memorandum of understanding attached to existing union contracts. Labor agreements are negotiated by the executive branch but require sign-off by the Legislature. Frans argues that once the Legislature passed the labor standards bill, that sign-off requirement was met. "We negotiate these contracts. We submit them for approval or disapproval," he said. "So the last step is approval or disapproval by the Legislature, which they accomplished on May 24 and May 25." In other words, Frans said, the veto doesn't matter. He said his department will continue to pay out the benefits first offered last July; they needed legislative approval to be extended. Rep. Pat Garofalo, R-Farmington, said while the engineer contract was indeed ratified, the parental leave add-on for all unions was not. Garofalo points to specific language that said the leave policy wouldn't happen without the full bill being enacted. "It is an issue of checks and balances," Garofalo said. "It's important to understand that on these memorandums of understanding, if a Democratic governor can do this today and be allowed to do it, there's nothing to stop a Republican governor from doing this in the future." He expects a court challenge to try to stop Dayton, but isn't sure whether that would come from the Legislature or an outside group. "Whether the merits of the idea are a good idea or a bad idea are separate," Garofalo said. "We just can't have the executive branch running around doing what they want." Frans responds that the contingency Republicans were counting on isn't part of existing law. And since their bill got vetoed, only the ratification matters. "I think we're on sound legal standing," the commissioner said. The state's labor unions are proceeding with the Dayton administration's interpretation. Richard Kolodziejski, an official with the Minnesota Association of Professional Employees, the second-largest union for state government employees, said an alert went out Wednesday to all MAPE members telling them that the benefit would continue. "It is a huge sigh of relief," Kolodziejski said. "We have a significant number of younger workers coming into the state workforce who are looking to work for a competitive employer who is offering this benefit. Those individuals are able to take advantage of a benefit that really provides a lot of safety and security for their family, their newborn child, and really provides them a family-friendly employer and place to work."